Should have posted this a while back. 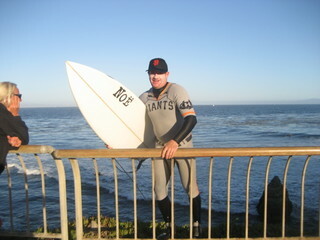 But tonight, I am going to a Giants game with my friend James. 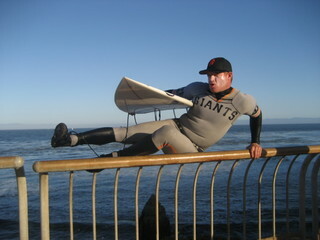 In honor of that, thought I’d share this Santa Cruz moment with you. He then went ahead and gave us a nice pose for the camera. Sliding into home. Something the Giants aren’t very familiar with – home plate. Oh yeah. I’m a Padre fan. They’re playing the Cardinals tonight. Don’t care about the Cardinals, but the only time I feel like I should ever root for the Giants is if they’re playing the Dodgers. Not sure who I’ll pull for tonight, but it will be fun. that guy has major issues… seriously you and I dont agree with baseball often but we can both agree on that… have fun at the game, padres are going down this weekend. Go dodgers. and those pics are totally disgusting. Watch out for the Cards, man. STL! Represent!